VERSA Technologies Inc. provides complete business communication and technology solutions for businesses of all sizes, including small to medium and enterprise businesses. We work with business clients throughout North Carolina, with the majority of our clients being located in Central NC. Our corporate office is located in the heart of North Carolina, on Fairchild Road in Winston-Salem. To learn more about the many business communication and technology solutions we offer, please contact VERSA Technologies Inc today at (336)-765-2004 or by submitting an online contact form. 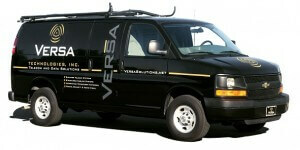 VERSA delivers all of your business communication needs in one easy solution.